What is Lancome Energie De Vie Exfoliating Mask? As per product’s official site, after launching its first-ever fix-all beauty cream in 1936, Lancôme’s climb up to worldwide fame and fortune became unstoppable. Its potential caught the eye of the global skin care giant, the L’Oreal Group, which acquired the brand in 1964, rebranding Lancôme as a luxury brand serving the impeccable taste and highly demanding Class A taste. As a luxury brand, Lancôme has exhibited resilience in its more than 80 years of operations and pursuit of indulgence in personal care. LANCOME Energie de Vie The Illuminating & Purifying Exfoliating Mask, US $55 for every 2.6 oz. jar, is a dual purpose face mask that moisturizes and exfoliates your skin at the same time. Lancome Energie De Vie Exfoliating Mask- Does it really work? This product works by delivering a solution that replenishes your skin’s lost nutrients and moisture while also revealing newer, lesser damaged skin by exfoliating the dead top layer. What are the ingredients in Lancome Energie De Vie Exfoliating Mask? Salicylic Acid: Works by helping the skin to shed dead cells from the top layer and by decreasing redness and swelling but incorrect use may lead to dryness and peeling of skin with hives and itchiness on the skin surface. The formula has a nice consistency that goes on well on skin and feels good during the session. The manufacturer discloses this product’s details, including how it works, and how to apply. But there is no mentioning of the ingredients which could an issue to people with sensitive skin type. This product lists Denatured Alcohol as a third ingredient, next to water and glycerin, which indicates that it is present in high concentration in this mask solution. Mask is bit slow and needs to be kept for longer time duration, but may still not be able to give expected results. Does Lancome Energie De Vie Exfoliating Mask have any Side Effects? Cleanse your skin before applying LANCOME Energie de Vie The Illuminating & Purifying Exfoliating Mask. Leave on for 3 minutes then, massage for another 3. Rinse off with lukewarm water. 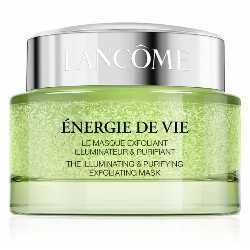 LANCOME Energie de Vie The Illuminating & Purifying Exfoliating Mask can refine your skin surface. As for moisturizing it, it’s highly doubtful because of the high concentration of drying alcohol in the formula.